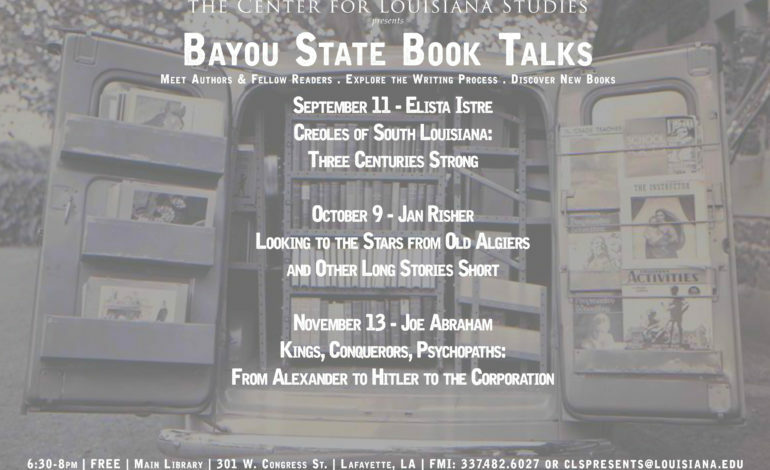 The Center for Louisiana Studies at the University of Louisiana at Lafayette launches its fifth season of Bayou State Book Talks on Tuesday, September 11, beginning at 6:30pm in the Main Library second floor meeting room. Admission is free and open to the public. Bayou State Book Talks is a monthly discussion series led by authors from Louisiana who have written books that are of interest to Louisianians. The series is co-sponsored by the Center for Louisiana Studies, UL Lafayette, and the Lafayette Public Library System. Talks are held at the Main Library in Downtown Lafayette, 301 W. Congress Street, on the second Tuesday of the month during the school year, from 6:30-8pm. Kicking off the series in September is Elista Istre’s book Creoles of South Louisiana: Three Centuries Strong, an invitation to enter the Creole world—a place where cooks tempt taste buds with gumbo and crawfish, storytellers mesmerize young and old with tales tied to three continents, and musicians and dancers pulsate to the rhythms of accordions and rubboards. Despite inside pressure to isolate and outside pressure to assimilate, Creoles from all walks of life continue to forge new identities while preserving and celebrating traditional elements of their rich heritage. Books will be available for purchase and signing. For more information about this event, the Center for Louisiana Studies and its many other activities, please visit our website, http://louisianastudies.louisiana.edu, call 337.482.6027, or email clspresents@louisiana.edu.